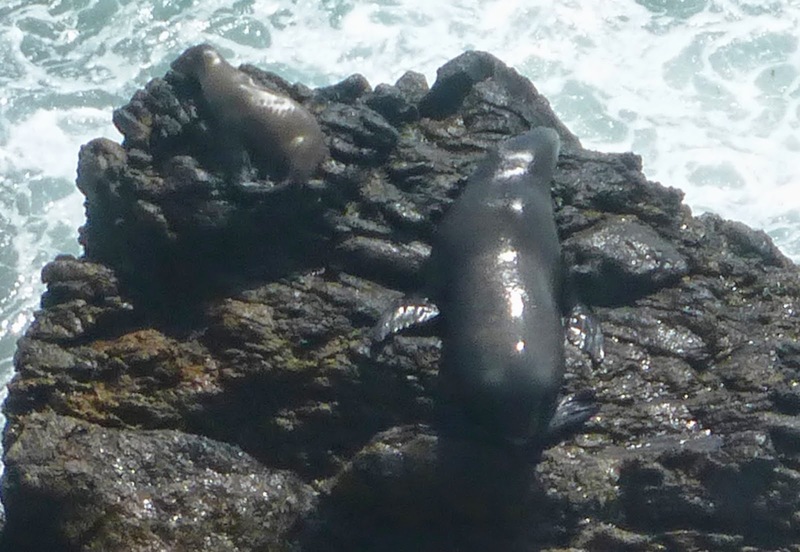 In spring, the sea lions congregate on the rocks below the Point Dume Headlands. This area is only accessible by humans during the lowest tides and treacherous tides and submerged rocks make it off limits to any vessel with a deeper draft than a kayak, but you can get a glimpse of the colony from the trail that winds around the edge of the cliff and you can hear the sea lions—and smell them—from nearly a half a mile away. The rookery is indescribably smelly and noisy—like a 100-piece orchestra tuning up in a feed lot. Sea lions are almost comical on land, waddling, lounging, chatting and arguing with friends, sunning themselves with evident contentment, just like human beachgoers. However, in the water they are transformed into graceful, powerful sea spirits. It's easy to imagine one might hear mermaids singing when one catches an unexpected glimpse of a sleek swift form gliding through the waves. From the vantage point of the wooden lookout deck on the east side of the Point Dume Headlands, the whole exuberant crowd of sea lions lazing on the rocks and playing in the water evokes some mad Romantic painting of sea nymphs. One of Swiss symbolist Arnold Böcklin's sillier paintings, c. 1885, but it captures the same exuberance. Image via Wikimedia Commons. 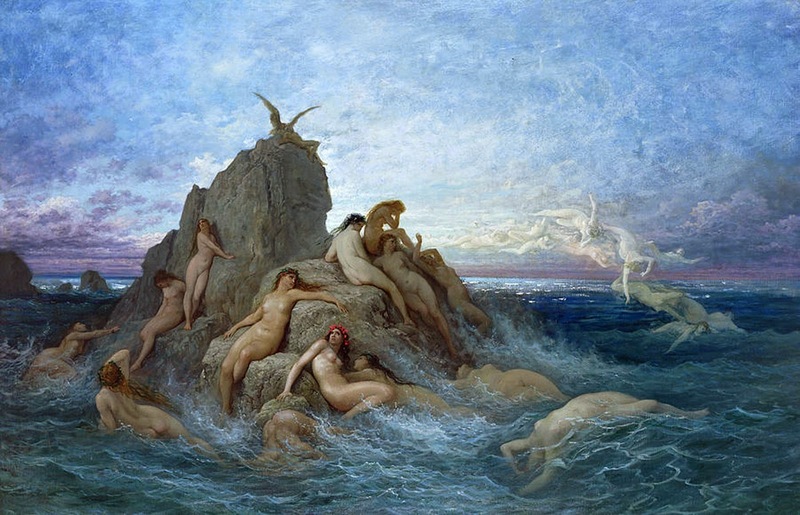 Nereids—Greek water nymphs—seem to share the sea lions' fondness for rocky roosts. These are Les Oceanides, taking a break from minding their rivers, apparently. The painting is by Gustav Dore, via Wikimedia Commons. Sea lions are eternally curious. They like to drop in on waves to check out what the surfers are doing or pop up near swimmers to see if you doing anything they should know about. Sometimes they keep you company while you're walking on the beach, following along in the water, bobbing ahead and doubling back, until they grow tired of the game and the dull humans who so often seem oblivious. 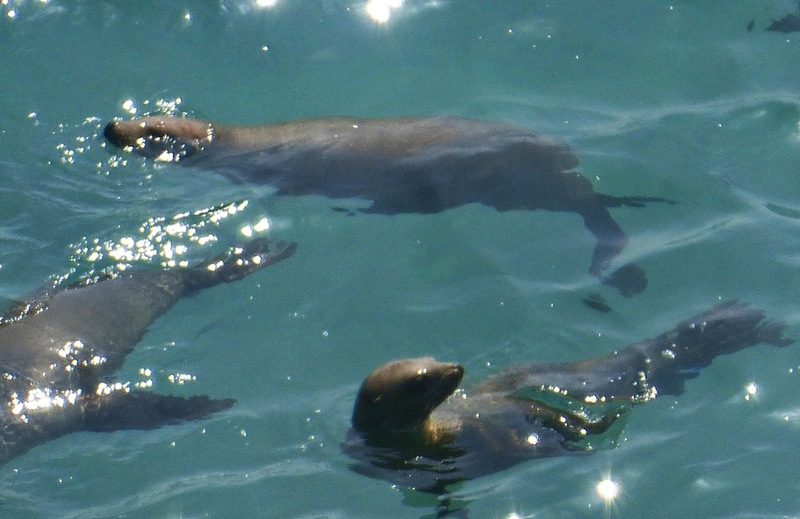 However, life isn't as idyllic for sea lions as it is appears to be for mermaids. Sea lions depend primarily on fish and squid and can face starvation in years when the fish population crashes. 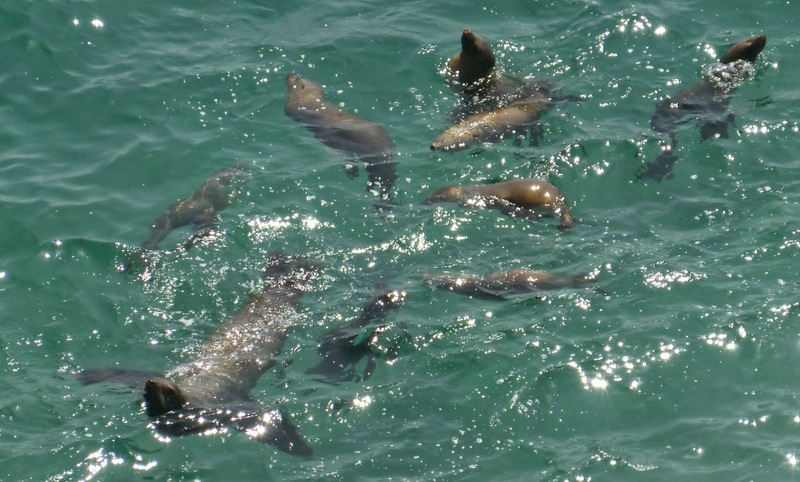 Sea lions can also be poisoned by domoic acid generated by the organisms that create the phenomenon known as red tide, and they are always at the mercy of the weather. Although these marine mammals are highly intelligent, sociable and playful, they face myriad hazards that include encounters with white sharks and orca—their natural predators, as well as human-caused hazards, like gill nets, ship strikes, loss of beach habitat, and even bullets. They have also adapted to humans, taking advantage of breakwaters, buoys, and docks for hauling out, and following fishing boats in hope of a free lunch. Sea lion cows give birth in early summer. 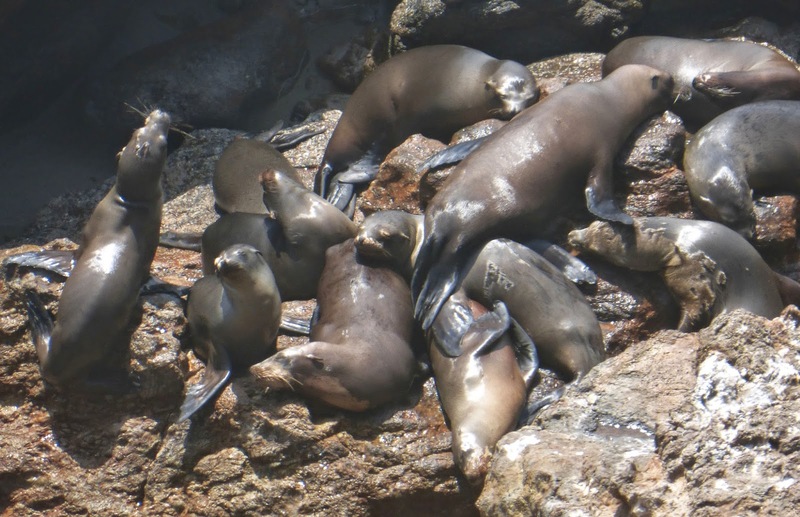 It's early in the season for pups at Point Dume, but there are currently plenty of weaners and yearlings— sea lions that are just striking out on their own. These young animals sometimes have a difficult time fending for themselves and occasionally turn up stranded on local beaches. 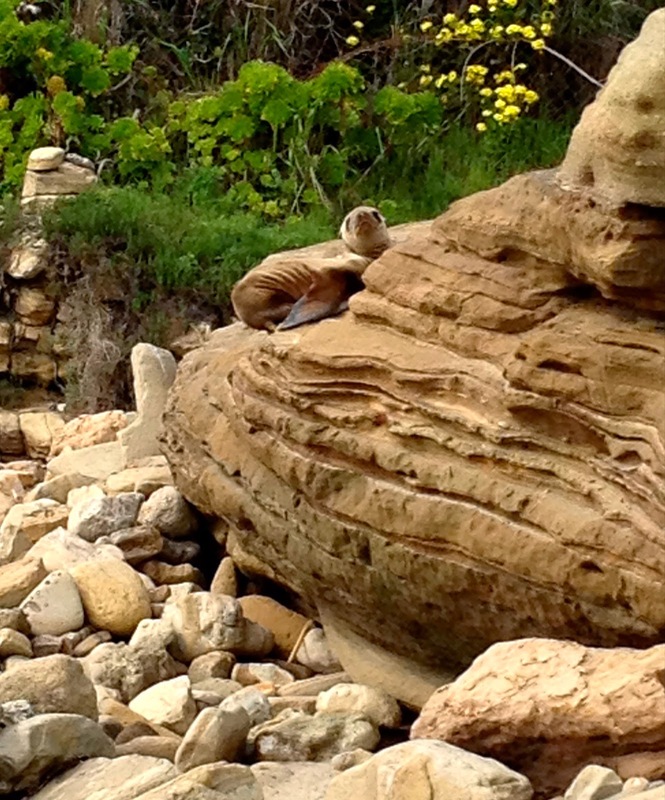 Malibu residents and beachgoers also encounter pups on the beach, or more often on a rock above the high tide line. Sea lion cows stay with their newborns for the first week or two, and then leave them in a safe place to forage for food. It can be difficult to tell whether a pup is safe and well and waiting for mom to return or if it's sick or injured. While sea lions are otariids—walking seals—and are able to move fairly rapidly on their powerful front flippers, they are still at a serious disadvantage on land and can be frighted by the presence of humans and injured or even killed by off-leash dogs. 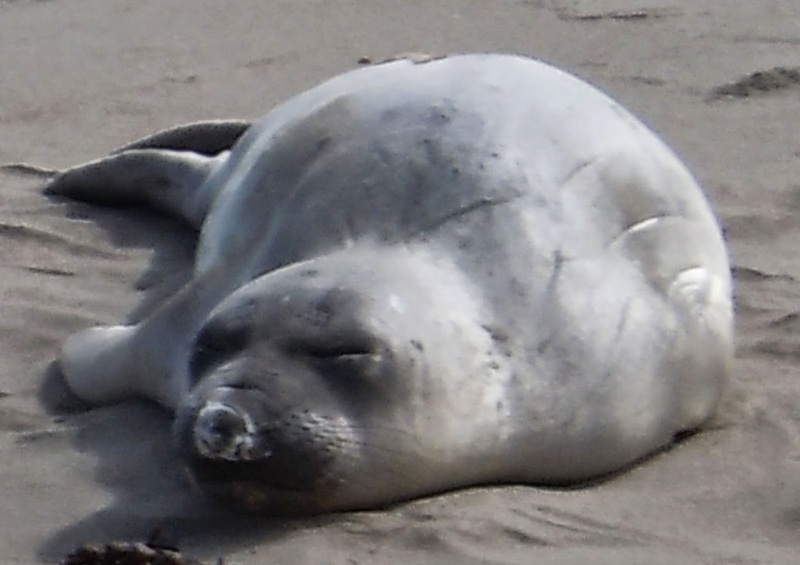 At this time of year, young elephant seals and harbor seals can also end up on local beaches. Anyone who encounters a stranded or distressed marine mammal of any type is encouraged to call the California Wildlife Center's Marine Mammal Team at 310-458-WILD (9453). The CWC is currently swamped with young native animals of every species and donations are welcome—seal and sea lion pups need to eat enourmous quantities of fish and the center is a non-profit that depends on support from the community. Don't touch and do not pick up, pour water on or feed the animal! They are wild animals and can bite. They also are easily stressed by humans. 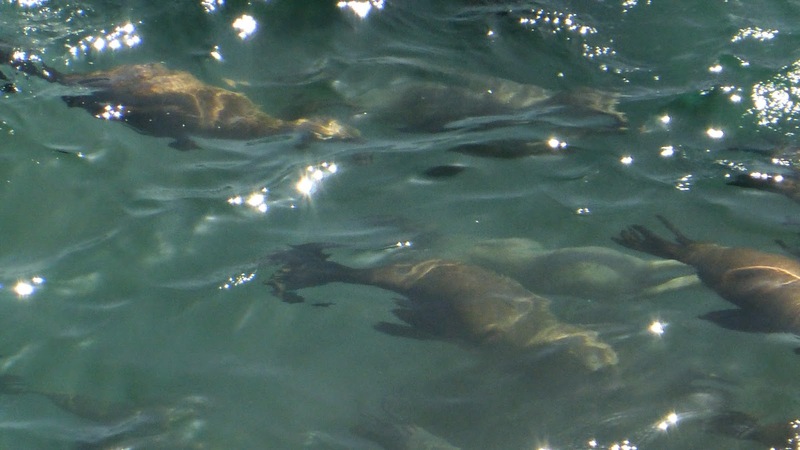 Seals and sea lions temporarily "haul-out" on land to rest. Harbor seal mothers often leave their pups ashore while they're feeding at sea. A beached whale, dolphin, or porpoise should be reported immediately. DescribeNote physical characteristics such as size, presence of external earflaps, and fur color. This helps us determine the species, what rescue equipment and volunteers are needed. Note the animal's condition. Is it weak and underweight? Are there any open wounds? IdentificationDoes the animal have any obvious identification tags or markings? Determine the exact location of the animal in order to provide accurate directions. We cannot rescue an animal if we cannot find it! Call the Rescue Team with as much information as you have (310) 458-WILD (9453). 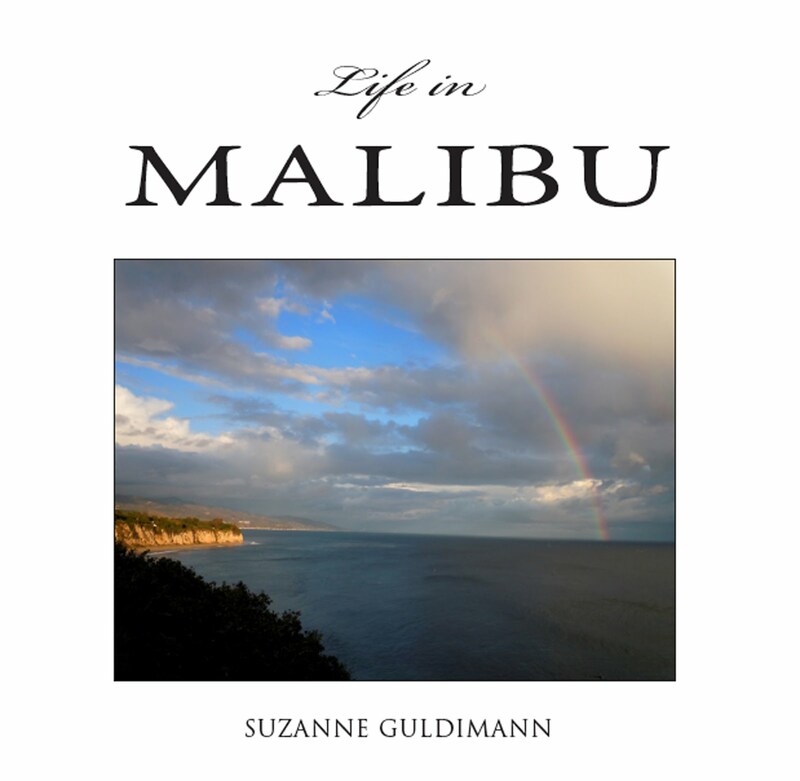 The day I took the photos of the Point Dume sea lion colony I met a friend on the trail to the lookout. "There's a man there who told me that mermaids are real," she said. Alas, the man was gone when I arrived, but whoever he was he put the thought of mermaids into my head that day and reminded me of the first time I saw a sea lion in the water as a child and how much I wanted it to be a mermaid. Mermaids may be vanishingly rare these days, but how fortunate we are to still have marvels like sea lions. 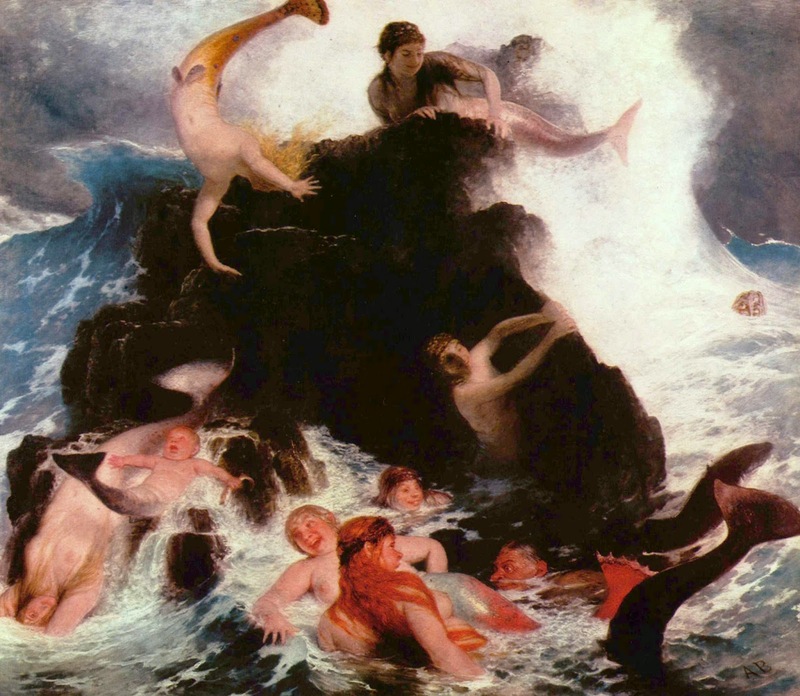 Very few mortals have the chance to hear mermaids singing, but around here we are blessed with something that, in its own way, is just as miraculous and wonderful. 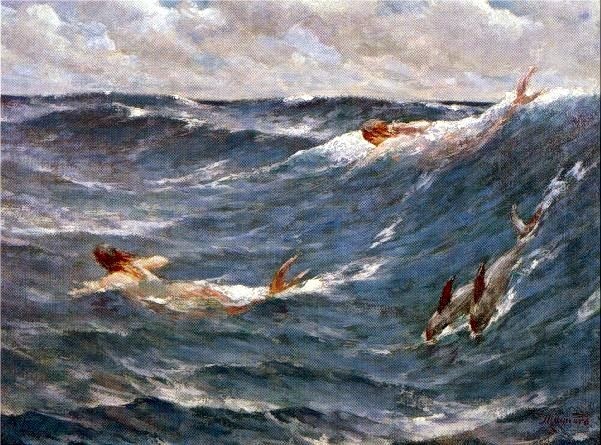 Above, Mermaids frolic in a study by 19th c. American impressionist George Willoughby Maynard. Below, a trio of Point Dume's resident merfolk enjoy calm seas.